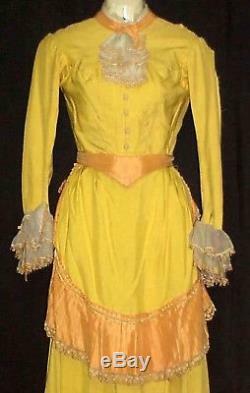 FABULOUS CIVIL WAR 1880'S WESTERN FRONTIER PERIOD GOWN. WE SPECIALIZE IN OLDER VINTAGE MOVIE WARDROBE AND HAVE THOUSANDS OF REAL MOVIE WORN ITEMS IN CURRENT INVENTORY! This is a lovely 4 Piece Period Gown we are offering! The gown is done in a beautiful gold textured material. The bodice has a small standup collar with pale orange satin ribbon with a center front bow and sheer ivory around the top of the collar. The center front of the bodice at the neckline has a sheer white pleated piece that is edged with tatted lace. There is a waistband done in the orange satin with a pointed center front. 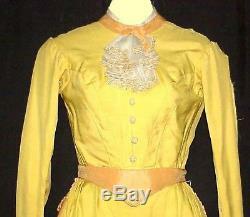 The long sleeves have cuffs done in the sheer white with tatted lace and a row of the orange satin ribbon. The bodice is fully lined and has 5 of its original 7 stays still intact. It fastens with a metal zipper. The magnificent skirt is VERY, VERY full! 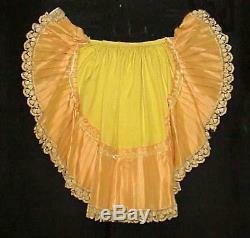 There is an apron with a wide row of orange pleated satin around it. The pleated satin is edged in an ecru lace on the bottom and a row of ecru velvet at the top. The lower 3rd of the skirt has alternating rows of 1/2" orange satin ribbon and & 7" wide gathered orange satin material edged with very small tan tatted lace. These wide orange rows are gathered to the side for a very unique look! On the back of the skirt, the lowest row of gathered orange satin has come unstitched and needs to be re-tacked to the gown; the upper wide row does not go all the way around. At first, I thought it had been removed however it stops at the points shown. This is an attachment for the back that is edged the same as the apron. The 4th piece to the gown looks like a smaller apron. 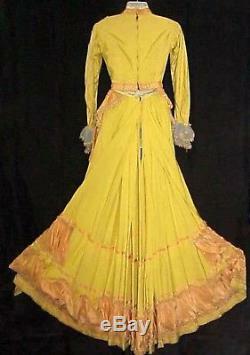 This magnificent gown has labels from Western Costume Company. NOTE: As stated - this gown is in need of some TLC! The left sleeve and shoulder is frayed apart and needs repair - one easy way would be to use the material from the 3rd or 4th piece to cover it! The sleeves are fully lined. There are some small holes that need repair and there is wear & fraying to the back hem from walking. Please keep in mind the age of this gown! This magnificent gown measures approximately a 32"/33" bust and a 22 waist. The skirt measures about a 22" waist and 47" in length. Please keep in mind the age of this gown and the fact that it WAS WORN in the movies it should be professionally cleaned! This is a beautiful collectable and needs to be seen to be appreciated. 99% of the time, with good communications almost any problem can be solved. Please keep in mind we sell Hollywood Wardrobe that is collectable. Please remember Communication is EVERYTHING because we will bend over backwards to help our valued customers. 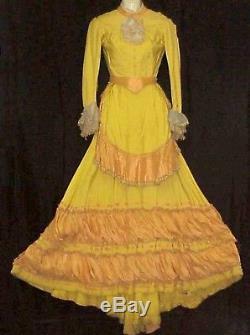 The item "CIVIL WAR WESTERN FRONTIER 1880s 4 PC PERIOD GOWN" is in sale since Wednesday, June 6, 2012. This item is in the category "Entertainment Memorabilia\Movie Memorabilia\Wardrobe\Originals". 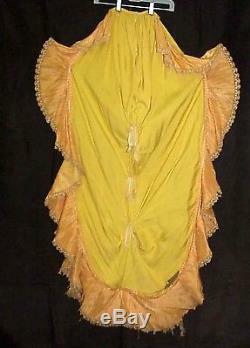 The seller is "hollywoodmoviecostumes" and is located in Hesperia, California. This item can be shipped worldwide.